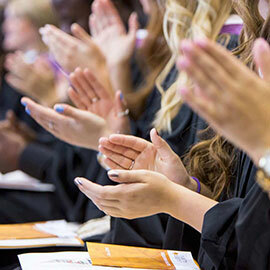 Waterloo – Nearly 2,200 students will graduate from Wilfrid Laurier University during spring convocation ceremonies June 11-15 at Lazaridis Hall on Laurier’s Waterloo campus. At Laurier’s Brantford campus, 589 students graduated on June 5 and 6. A number of eminent Canadians and members of the Laurier community will also receive special honours. Journalist and broadcaster Nora Young and mental health advocate Mary Deacon will receive honorary degrees and speak at their respective ceremonies. Young, who will receive an Honorary Doctor of Letters on Monday, June 11 at 2 p.m., is the creator and host of CBC Radio One’s Spark and author of The Virtual Self. Deacon, chair of the Bell Let’s Talk campaign, will receive an Honorary Doctor of Laws Degree on Wednesday, June 13 at 1 p.m.
Linda Fabi (BA '75 and MA '82), former director of education of the Waterloo Region District School Board, will receive the Order of Wilfrid Laurier on Thursday, June 14 at 1 p.m. The Order of Wilfrid Laurier recognizes exemplary and distinguished service by members of the Laurier community. Several Laurier faculty members and instructors will also receive awards at convocation ceremonies. Professor Jonathan Crush will be officially named Laurier’s University Research Professor for 2018/19. The award recognizes continuous and outstanding achievement in research by a full-time faculty member. Crush, a renowned African migration and food security scholar, will be honoured on Tuesday, June 12 at 9:30 a.m. Associate Professor Sofy Carayannopoulos will receive the Faculty Award for Service Excellence and Community Engagement. Carayannopoulos, a business strategy expert who has won awards for her teaching, has been a major part of the success of Lazaridis School of Business and Economics teams in national and international case competitions. She will be honoured on Friday, June 15 at 9:30 a.m. Associate Professor Julie Mueller will be presented with the 2018 Donald F. Morgenson Faculty Award for Teaching Excellence in the category of Innovation in Teaching. Mueller, a member of the Faculty of Education and Department of Psychology, is an expert in the use of technology in teaching and learning. She will be honoured on Thursday, June 14 at 1 p.m.
Camellia Bissessar will be presented with the 2018 Laurier Student Teaching Award of Excellence in the undergraduate category on Thursday, June 14 at 9:30 a.m.
Laura Neil will be presented the 2018 Laurier Student Teaching Award of Excellence in the master’s category on Monday, June 11 at 2 p.m.
Olufunke Oba will be presented with the 2017 Laurier Student Teaching Award of Excellence in the doctoral category on Thursday, June 14 at 1 p.m.
As of June 4, 2,178 students had qualified to graduate in the Waterloo ceremonies. Of those 1,755 are earning undergraduate degrees, 295 graduate degrees and 128 diplomas. In addition to recognizing the hard work and dedication of all of its graduands, the university will feature the stories of Elizabeth Clarke, who overcame many challenges, including the deaths of her parents, before achieving her degree, and Kendra Young, a Laurier staff member who earned her degree little by little over 30 years. All convocation ceremonies are ticketed events. For those unable to attend, live streams of the ceremonies will be available. View a complete convocation schedule for spring 2018.